Caesar is well and eating again after he stopped eating properly for a few weeks. I want to share this experience so that if any of my followers have this kind of issue with their cat they can do what I did to bring their kitty back on track again fast. Caesar’s blood work was all normal, he had no physical signs of tumors and his x-ray was clear. So, why wasn’t he eating? I contacted our Holistic veterinarian Dr Anna Gardner from www.petsynergy.com for a consult by email. 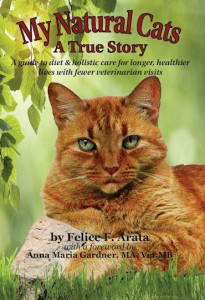 She looked at his blood work and asked me a few questions then prescribed a remedy suited for him along with giving daily doses of Slippery Elem, a very good Probiotic, Milk Thistle to detox his liver for a few weeks and Feline Enteric Support to support his intestinal track for the rest of his life. Caesar is 16 years old this year and in cat years that is 80 years old. Most people have digestive disorders at that age and need a liver detox! In addition to all the above, I decided to add some organic canned pumpkin to his meals and in just a few days Caesar was eating again with real gusto! I am continuing the pumpkin in his meals because he truly loves it. Caesar is running around the house, up the cat trees and scratching with loads of energy on the scratch poles, while yelling loud his usual MEOW to me. I know he feels like he is reborn again and I feel a world of worry and stress has been lifted off my heart and shoulders. PS: Conventional vet care would have only sent him backwards because all they could do was prescribe preds or appetite stimulants that would create other serious issues from the side effects; I know, because I tried one of their appetite stimulants and Caesar did eat for two days but on the 3rd day he just got worse and stopped eating completely! 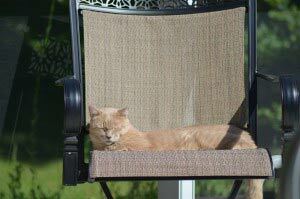 Here is Caesar soaking up the sun after his raw meal laced with pumpkin..looking so satisfied and content.